Xstrata tops the Dow Jones Sustainability Index for the basic resources sector for the second year in a row. Most important changes of the index for the mining industry are the inclusion of Newcrest and Kinross, and the removal from the index of ArcelorMittal and Goldcorp. Assessment criteria include economic, environmental, and social topics. Full list of criteria can be found here. Inclusion in the DJSI is mainly a marketing issue; it does not have direct operational or financial consequences. Many countries do require foreign investors to adhere to global reporting initiatives to ensure a certain level of sustainability, but DSJI requires a much broader set of policies. Xstrata especially scores higher than industry average in terms of climate strategy, mineral waste management, human capital development, and standards for suppliers. The benchmark report will certainly be used by some companies to prioritize areas for improvement. “Glencore recorded more deaths at its industrial operations last year than any of the other “big five” London-listed miners. The world’s largest commodities trader listed the deaths of 18 employees and contractors in its first disclosure of safety and environmental information. Together with an extensive half-year results report and presentation, Glencore published its first sustainability report this week. Glencore’s fatality frequency rate (FFR: fatalities per million hours worked) was 0.1034 in 2010, down 25% compared to the previous year. The All Injury Frequency Rate for mining activities was 3.45, down 17% from a year earlier. The comparison with other large miners as made by the Financial Times is rather shortsighted. Risks at any type of operation are unique and cannot be compared easily. With the nature of Glencore’s assets (Kazzinc, Katanga, Mutanda, Mopani, Los Quenuales, etc. ), which are often located in developing countries and/or operated by local companies, it is obviously harder to manage safety than in large centralized operations in Western countries. However, it is a good sign that Glencore reports the figures and indicates it wants to manage safety at a global level. “India’s Supreme Court has extended a ban on iron ore mining in two new districts in the southern state of Karnataka, a lawyer involved in the matter said Friday. Panindra Rao, a lawyer representing the mining industry, told Dow Jones Newswires that a court-appointed body found prima facie evidence of environmental degradation in the districts of Tumkur and Chitradurg. ‘[The court] has stopped mining and transportation operations in Chitradurg and Tumkur districts,’ he said, adding that a panel has been asked to make a detailed environment impact study of these two districts. “Australia plans to protect its spectacular West Kimberley region from environmental degradation caused by mining and development. An area of wilderness bigger than England will be classified as a National Heritage site to help guard its rare attractions including 130 million-year-old dinosaur footprints. The Indian district of Karnataka is responsible for approximately a quarter of India’s iron ore exports and a fulfills a significant part of domestic demand. Environmental degradation in the area is mainly caused by illegal and/or poorly controlled mining. The key fight between industry groups and environmental lobbyists in Australia is about the development of a gas terminal for Woodside in the West Kimberley region. Industry groups are not happy because they will have to introduce tighter controls (although the developing partners do not see the introduction of the site as a stumbling block), while environmentalists see the introduction of a heritage site as useless if the development of the complex goes on. The current boom of the mining industry has encouraged governments around the world to put stricter environmental regulations in place, knowing that companies are willing to go a long way to be able to continue with their projects. While the main government interventions in India are around increase of government control and institutionalization of the industry, interventions in Australia, the US, and other OECD countries mainly focus on preserving specific areas or species. The actions of the Australian government should partly be seen as a political move, countering the critics that the government has been too mining-friendly by watering down the super profits tax. “Vale’s finance chief said the Brazilian miner would invest in development programmes in Guinea in an attempt to safeguard a $2.5bn mining concession and avoid making a large pay-out to the African country’s new government. In spite of still being vulnerable to a review of mining licenses in Guinea, Guilherme Cavalcanti said that Vale could win the government’s approval for its Simandou iron ore project that it shares with rival Rio Tinto by paying for education and agriculture in the communities where it mines. The Simandou deposit is divided into 4 blocks: Vale controls blocks 1 and 2 with the Benny Steinmetz Group (BSG) as minority shareholder; Rio Tinto controls blocks 3 and 4 of the Simandou deposit, working together with Chalco. 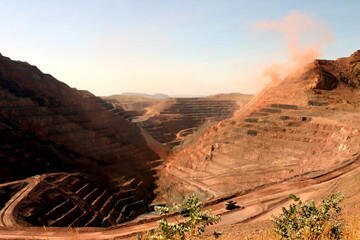 In an earlier stage Rio Tinto held title to the full deposit, but the Guinean government cancelled this deal. In a review of mining licenses announced in March the Guinean government requires a minimum of 33% of ownership of strategic mining projects in the country to increase government control. Rio Tinto struck a deal on the redistribution of ownership at the end of April, setting up a long term phased process of acquisition of ownership by the government. Furthermore the company agreed to a conditional one time $700mln payment to the government and promised to develop a railway to export the ore via a Guinean port. The social projects promised by Vale are a mere hygiene factor in the negotiations about transfer of ownership. The government will clearly expect any operating partner to take an active role in community development. However, Vale’s experience with large scale operations in developing areas in Brazil and Mozambique might help to gain trust. Most likely Vale will agree on a conditional and phased deal similar to Rio Tinto’s agreement with the government. The agreement will be designed to make any payments or ownership deals conditional on crucial milestones and actions by the government. Vale will still need to decide on a way to export the ore, either negotiating to use the railway build by Rio Tinto, or setting up the infrastructure to export via Liberia.